The natural world is my inspiration and classroom. It has been an integral part of my life-long quest for meaning and offers many truths and teachings, a driving force of existence. I enjoy depicting my thoughts and feelings about it in my paintings, sometimes in very subtle ways. Since I became more in tune with the natural world I have had many wonderful experiences observing nature. I watched barn swallows construct a nest on the side of a wall with repeated small portions of mud in their beaks, each drop carefully placed. I watched an ant carrying a large sunflower seed over a mound of gravel to an anthill. The seed dropped several times in between the stones, but the ant persisted and climbed down to retrieve it each time before finally delivering its prize to the anthill. From Nature, I learn patience, faith, compassion, courage, awareness, and not to give up when things look grim. 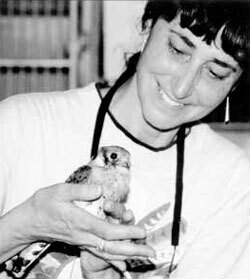 Then in 2003, I provided first aid to a sick, swallow nestling that had been thrown out of its nest several times by the parents. I named him Piccolo Caesar - Little Caesar. I replaced him in the nest and watched as the parents resumed taking care of him. Caesar had a strong will to live. He didn’t give up on himself, so I didn’t. I proudly watched him the day he learned to fly. This led to an opportunity to volunteer at a wildlife rehabilitation center in the intensive care unit. As Mahatma Gandhi said, "The greatness of a nation and its moral progress can be measured by the way in which its animals are treated." I believe that the humane treatment and caring of animals deepens our spirit and makes us better people. My love of storytelling has also found its way into my work. To the canvas I pass on the stories of my subjects, both animals and people. This has led to commissions from Native American tribes, individuals and churches for murals and paintings created from their stories. One of the experiences that exemplified this powerful dynamic was an encounter I had with a Navajo Medicine man in 2002. Sitting around a campfire, coyotes howling in the night, hoof prints of wild horses carved in the ground, and ancient Anasazi ruins echoing their past around us. I watched and listened as he sang old Navajo songs and told stories. Suddenly I noticed the reflections of the fire on his face that created an image of timelessness. How many generations have heard these stories? I wondered. At that moment, I knew what a storyteller was. From this inspiration and understanding, I created a painting, Storyteller II. Now I am called to revisit the homeland of my family in Trasacco, Italy. This is the village that my father left at age 15 in 1930 and never returned. Many of my relatives still inhabit this 2,000 year-old village east of Rome. I would like to capture their images, long, rich history and landscape on canvas and tell their stories. In 2012 I was invited to retun to Italy because of my book Kater Native American Saint. I attended her cannonization in Rome. I was able to extend my trip two weeks longer. In that extra time I got to know my relatives in the town of Trasacco, located in the Abruzzi mountians. I was also able to visit my Italian grandmother's town near the city of Celano. Where I visited the San Giovanni Church and was able to trace back many generations of my family. Through art, every brushstroke brings me closer in my quest to discover old instincts and how I relate to the world around me. As I capture the spirit of my models on canvas, they bring life to me as well. It is a union of mutual respect and gives me the courage to fly. © 2018 Giovanna Paponetti. All rights reserved.